A true Le Cordon Bleu graduate having studied the Grand Diplôme in Paris followed by the Bachelor of Business (Restaurant & Catering Management) & the Graduate Certificate in Gastronomy with Le Cordon Bleu Adelaide. Having made the successful transition from the kitchen (as a full-time chef) to business (international hospitality consulting), United-States born Justin Silverthorn is one of a rare breed. He attributes Le Cordon Bleu with opening doors he had not previously thought possible. Justin Silverthorn is founder and principal of Advanced Foodservice Solutions International, which has offices in Washington and Philadelphia and Sao Paolo, Brazil. The business provides food service design and management consultancy services for a vast array of immerging hospitality markets. 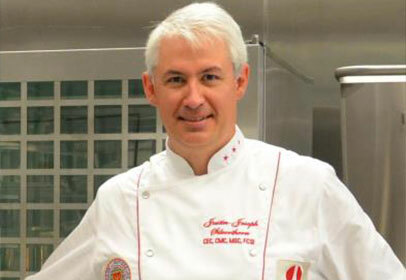 Justin set out on his culinary path at Le Cordon Bleu Paris in early 2002, graduating with the Grand Diplôme. He then embarked on a culinary career, working in a number of Paris’ three-star Michelin restaurants. Two years on and Justin began turning his mind to the business side of hospitality, which led him to Le Cordon Bleu Adelaide, where he graduated in 2005 with the Bachelor of Business (International Restaurant & Catering Management). He says that Adelaide is where he honed his knowledge and skills, helping him excel in the business world he lives in today. ‘My time at Le Cordon Bleu Adelaide provided me with not only a solid foundation through its structured curriculum, but also the academic discipline that opened doors I had not previously thought possible. Le Cordon Bleu was instrumental in my transition from full-time chef to pragmatic and focused businessperson. Justin says that looking back, his approach to business is a direct reflection of the passion and drive instilled in him by his Le Cordon Bleu lecturers. I realise now that Le Cordon Bleu truly helped me define my work ethic and guiding principles, giving me the chance to fulfill my dream to become a professional consultant on many gastronomic fronts.